Short on time? 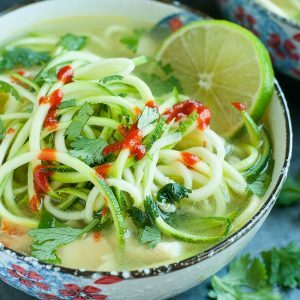 Try this speedy + spicy sriracha lime chicken zoodle soup! Zucchini noodles have never tasted so good! Cut your chicken into slices and add to a pot over medium-high heat. Add broth, garlic powder [or fresh garlic!] and cumin and bring to a boil. Once boiling, reduce heat and simmer until chicken is cooked thoroughly, about 10 minutes. While the chicken cooks, use a spiralizer to transform your zucchini into tasty noodles. Once the chicken is ready, add zucchini noodles and lime juice to the soup and simmer for an additional 3 minutes until desired tenderness is reached. For softer noodles, feel free to cook them a tad longer. Transfer soup to two large bowls and top each with fresh cilantro and a hearty drizzle of Sriracha chili sauce. Add a little, or a lot! I go nuts with mine, the garlic chili sauce flavor is fantastic with the tender chicken and savory broth. Serve with lime wedges for a burst of citrus flavor. Dive in while it's hot! Feeling feisty? Try it with crushed tortilla chips on top! For a speedier soup, I cut my chicken breast into 2-inch pieces before adding it to the broth. Feel free to skip this step, or even use bone in chicken breast if you'd like, just note that the cooking time of this will be about 20-30 minutes longer.If you're lucky enough to have leftover chicken handy or are partial to using rotisserie chicken to save on time, go for it! No spiralizer? No problem! Simply use a julienne slicer or a plain ole veggie peeler and slice zucchini into ribbons. WHOLE30 - Simply use your favorite cayenne-based hot sauce in place of the Sriracha!